You know when a riff has entered the mainstream musical consciousness when it's not only guitarists who yearn to learn it, but also players of other (often more obscure) instruments, too. Here, we present the ten greatest guitar riffs of all time (as voted for by users of MusicRadar) as you've never heard them before. Get ready for kazoos, manualism, ukuleles, an omnichord, an electone, a harmonica… and a tuna can guitar. Now, this is a bit of a weird one. A YouTuber known as The Owl decided that he'd cover The Stones' seminal song… but in the style of William Shatner (who himself has recorded some oddball spoken-word covers in the past). How this idea was formed isn't important: the relevant point is that we get to hear the main riff played on a muted trumpet. If Kurt Cobain had been a fan of George Formby, Nirvana's signature song would have ended up sounding something like this. Check out The Ukulele Orchestra Of Great Britain's website for more micro-guitar music. This pint-sized Jean Michel-Jarre goes by the name of Yuuki, and seems hugely proud of his ability to play John Lennon's most popular riff on one of his (or more likely his dad's) many synths. It's a feelgood victory for pushy parenting. Frequently the last refuge of the man who can't play anything else, the kazoo is more comedy prop than musical instrument. 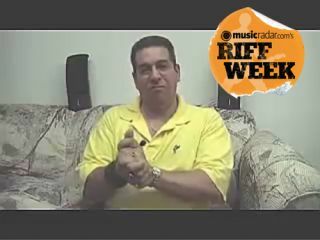 It's been put to good use here, though: with the help of some video editing software, Mister Tim has given you the chance to hear how Metallica's 1991 hit would sound if it was performed by a plague of wasps. Suzuki's cult Omnichord replaces the guitar in this live rendition of AC/DC's evergreen riff-powered monster: it's played by Matt Mahaffey of American pop/rock band Self. Impressively, he's also responsible for the drums and vocals - it's like watching a non-technophobic Jack White. Turns out there's a thriving community of musicians playing Electones - electronic organs manufactured by Yamaha. This video, uploaded by the fleet-footed YouTube enigma known only as the Electonist, sees him go to work on the classic Clapton riff. Everyone play the harmonica. Or rather, everyone thinks that they can play the harmonica. But this guy actually can, and if you follow his lesson, you might actually be able to as well. Yep, it's the kazoo again - you can't keep a good instrument down, especially a little plastic one with a vibrating membrane. As with many of the videos here, this one contains the whole song rather than just the riff, but even if you watch just the first few seconds, you'll get the general idea. A fine example of the art of manualism, which sounds like it should be a deviant sexual practise but actually involves its exponents squeezing air through their hands to create music. Gerry Phillips has been at it for the best part of 40 years, and his manualist take on the GnR standard is a delight. Make sure you stay tuned for the wah-wah solo towards the end. Ahh, tinned tuna - the oily fish staple beloved by students and bodybuilders. Most people's cans end up in the recycling bin, but Billy Doom managed to turn one into a miniature guitar. Primitive? Without question, which makes his passable rendition of the greatest riff of all time all the more impressive.